"De Bruyne was brilliant and the difference between the two sides, and City were exceptional in the first half." Manchester City bounce back after two defeats with a much-needed win over Southampton, who improved in the second half but not enough to salvage anything from the game. That's it from this game but you can follow reaction to the match and Saturday's other fixtures here. There will be three minutes of added time at the Etihad Stadium. Kevin de Bruyne is a bit special. He plays a first-time cross from the right which Wilfried Bony horribly mistimes. Just when Man City looked comfortable, Southampton give them a scare as Sadio Mane has a shot palmed wide by keeper Willy Caballero. Southampton are not giving this up lightly. Manchester City look in control now after restoring their two goal lead. A second Kevin de Bruyne assist. The Belgian found Aleksander Kolarov well to fire home from an angle. The home side let out one of the biggest cheers of the afternoon as David Silva comes on after nine games out with an ankle injury. The Spaniard replaces Raheem Sterling. Manchester City score against the run of play. Kevin de Bruyne shows great awareness to delay his cross before picking out the unmarked Aleksandar Kolarov, who controls the ball before driving in a left-foot shot. Just seen a replay of that Shane Long penalty appeal and he had a good claim as his shot appeared to hit the arm of Fernandinho. Man City keeper Willy Caballero isn't inspiring the greatest confidence as he saves a Dusan Tadic shot but almost palms it straight into the path of Shane Long. Manchester City striker Sergio Aguero has had his injury troubles and manager Manuel Pellegrini will have more concerns over his striker as he takes him off. Aguero lands awkwardly as he fails to get on the end of a cross and hobbles off, with Wilfried Bony coming on in his place. Southampton forward Dusan Tadic is allowed to waltz through the heart of the Manchester City defence before he has a chipped shot palmed away by keeper Willy Caballero. Striker Shane Long hits the rebound into a crowded box and the ball is deflected wide as the visitors appeal in vain for handball. James Ward-Prowse is booked for a foul on Raheem Sterling and referee Roger East quickly has his yellow card out of his pocket again as City centre-back Martin Demechelis is punished for bringing down Shane Long. Simple as you like from Southampton for their goal. Steven Davis to Dusan Tadic to Sadio Mane, whose cross is headed in from close range by Shane Long. "Shane Long gets up very early, he does not give the defender a chance, he puts his elbow on the shoulder and he can't get up, a great goal." "Great cross into the box and a simple goal for Southampton. "Sterling allowed Bertrand to run in behind him. It was a great climb by Long, a powerful header, and the City keeper had no chance. Suddenly, it's now game on! "City had been so dominant, but they switched off for just 30 seconds and now they've conceded." It's just got rather interesting at the Etihad Stadium. Sadio Mane swings a dangerous cross to the far post and Shane Long beats defender Martin Demechelis to the ball as he heads in. A bit of deja vu from the frsit half at the Etihad Stadium. Manchester City start the second half strongly and Raheem Sterling robs Maya Yoshida. This thime, though, there is no goal as Fabian Delph can't control Sterling's pull-back and Southampton clear their lines. Southampton make a change at half-time with Dusan Tadic coming on for Oriol Romeu. "Southampton looked good for about 30 seconds which woke City up and they have been brilliant since and superb going forwards. Southampton have given the ball away unnecessarily in dangerous areas of the pitch in the middle and final third. "They are lucky it is only 2-0. The next goal is crucial, if Southampton are able to nick it then game on, but if City get it then we might as well go home and get by the fire." "Manchester City started with real intent and are in charge at the break." Manchester City right-back Bacary Sagna and Southampton centre-back Virgil van Dijk both receive treatment. Both seem OK to continue, with van Dijk sporting a bandage around his head. The visitors give the ball away again and, after Yaya Toure makes a powerful run into the Southampton area, only a heavy touch by the Ivory Coast midfielder lets keeper Maarten Stekelenburg the chance to intercept the ball and stop him getting in a shot on goal. Southampton striker Shane Long makes a run behind the Manchester City defence and attempts a first-time shot from the edge of the box which is saved by keeper Willy Caballero. "The conditions are not getting any easier. The rain is getting heavier." Jose Fonte is not going to come back on the pitch and Southampton replace the injured centre-back with Steven Caulker. Manchester City almost take advantage of Jose Fonte being off. Yaya Toure releases Kevin de Bruyne down the right flank and he puts in a low cross which is missed by Sergio Aguero and blazed over the visitors' goal by Raheem Sterling. Southampton are down to 10 men for the time being as defender Jose Fonte has gone off for treatment. "City deserve that, maybe justice has been done, because just before Delph's strike Steven Davis did seem to lean his arm out. But it was a magnificent strike from Delph, it hits van Dijk on the way through and wrong foots Stekelenburg. "City have been magnificent, this is the proper City. Last week they were terrible but this week outstanding." Willy Caballero does not look too convincing in the Manchester City goal. He weakly palms a James Ward-Prowse free-kick out and Victor Wanyama hooks in a shot which the keeper blocks away. Good and bad from the Argentine keeper. Southampton centre-back Virgil van Dijk shows a nice little sidestep 25 yards out before unleashing a shot which comes back off the crossbar with keeper Willy Caballero well beaten. "There was a handball that should have been a penalty that diverted the ball behind, but from the resulting corner City scored. So maybe justice has been done." Manchester City have a strong case for a penalty when a Fernandinho header appears to be blocked by the arm of Steven Davis but the home side don't dwell on the decision as they score their second goal. A corner finds Fabian Delph just outside the area and his shot goes in off Southampton defender Virgil van Dijk. Manchester City were beaten 4-1 by Liverpool last week when they struggled to cope with the pressing high up the pitch by the Reds. City look like they've learnt a few lessons as they have an urgency and intensity about them which Southampton are struggling to cope with. Southampton are making life particularly hard for themselves. This time it's Oriol Romeu who gives the ball away as his stray pass finds Kevin de Bruyne. The Belgian slides a pass through to striker Sergio Aguero but he is foiled by on-rushing keeper Maarten Stekelenburg. "Sterling did brilliantly. Yoshida is trying to get back into a defensive position but Sterling just held onto the ball for a moment and was then able to pick out De Bruyne with the perfect cross. Well done Raheem Sterling!" "It's been an incredible topsy-turvy Premier League season, hasn't it? "This is the sort of game Man City have to win. The weather is absolutely awful, so stay at home and put BBC Radio 5 live on!" The goal from the home side had been coming and it arrives courtesy of an error by Maya Yoshida. The Southampton defender is caught in possession by Raheem Sterling, who charges down the left and squares a ball for Kevin de Bruyne to tap in. Southampton almost pay for Victory Wanyama's foul on Sergio Aguero. City left-back Aleksandar Kolarov's curling free-kick is palmed down by keeper Maarten Stekelenburg and he just manages to gather the loose ball on the goal-line before Nicolas Otamendi and Fernandinho can slide in and score. Southampton midfielder Victor Wanyama gets a talking to from referee Roger East after he brings down Manchester City striker Sergio Aguero. City are quickly out of the blocks and Raheem Sterling has a first-time shot palmed away by keeper Maarten Stekelenburg. You can listen live to commentary from the Etihad on Radio 5 live from 15:00 GMT, where Ian Dennis will be joined by former England defender Danny Mills. Listen by clicking on the tab at the top of this page or click here. “It can't be true. How can you pay someone that sort of money, I mean £800,000 a week? The rumours could possibly affect the fans, I don’t think the players would be affected. If it happens it happens and would be a welcome addition to the dressing room. At the moment, City have enough on their plate; they have to get back to winning ways and the rumours of a player like Lionel Messi coming in wouldn't be a big issue for them at all." David Silva gets a cheer from Manchester City fans when his name is read out over the tannoy as the announcer goes through the home side's substitutes. Is Pellegrini affected by Guardiola rumours? “If someone was asking me about another manager coming and taking my job, I wouldn’t answer the questions either so I do have sympathy for Manuel Pellegrini. It must be difficult for him, but I guess it’s part and parcel of being a manager at one of the biggest clubs in the world." "It's a rumour we've had the last two-and-a-half seasons," said Pellegrini,appointed by City in June 2013, when asked about the speculation. "I don't have a problem with that." Manchester City supporters lag behind their Manchester United counterparts in our BBC Sport Predictor leaderboard. Currently City are 10th, while Southampton are 12th in the table. Think you can help boost your team's fortunes? Just sign up and join your fellow fans in predicting the weekend's Premier League games. Bragging rights await! Wright hasn't played a Premier League game since 2006. Manchester City boss Manuel Pellegrini makes four changes to the side which lost at Juventus in midweek. Keeper Willy Caballero, left-back Aleksandar Kolarov, midfielder Fabian Delph and winger Raheem Sterling replace Joe Hart, Gael Clichy, Fernando and Jesus Navas. Playmaker David Silva and striker Wilfried Bony are back from injury and are on the bench. Man City XI: Caballero, Sagna, Demichelis, Otamendi, Kolarov, Fernandinho, Delph, Toure, De Bruyne, Sterling, Aguero. Southampton manager Ronaldo Koeman's side lost 1-0 to Stoke last time out and he make four changes from that game. Defender Maya Yoshida, midfielders James Ward-Prowse and Oriol Romeu start along with forward Sadio Mane. Cedric Soares, Jordy Clasie, Dusan Tadic and Graziano Pelle make way. Southampton XI: Stekelenburg, Yoshida, Fonte, van Dijk, Bertrand, Wanyama, Romeu, Davis, Ward-Prowse, Mane, Long. "Manchester City return to the Etihad hoping for the exact opposite scenario to their heavy defeat against Liverpool. "Manuel Pellegrini was as animated last week as we've seen him since he arrived in England, and will want a reaction from his players. "Whilst there was encouragement in their midweek display at Juventus,they will be determined to show the resolve that makes them many people's title favourites. "Southampton won't have to face Joe Hart, and with Vincent Kompany still out, will fancy their chances of extending their unbeaten away start. They will be intent on avoiding back-to-back defeats following a disappointing defeat to Stoke last time out." Manchester City haven't won in three games and have lost the last two which has resulted in the inevitable speculation resurfacing that manager Manuel Pellegrini will be replaced by Bayern Munich boss Pep Guardiola next summer. If Pellegrini wants to brush those rumours under the carpet again he needs a win from his side. But City face a tough proposition today in the form of Southampton, whose defeat in their last game against Stoke was their only loss in seven top flight games. By the way, it's a day for rain macs at the Etihad Stadium. 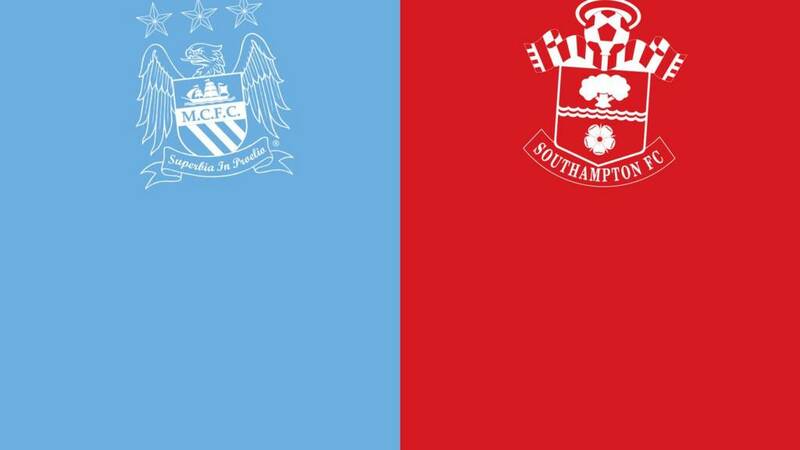 Welcome to our live page for Manchester City Southampton. Listen to Radio 5 live coverage, and we'll have text commentary here from 14:30 GMT. You can keep up to date with all the action from today's other Premier League games here.